For the second day, a Massachusetts driver has come face to face with fowl death in the form of a turkey that smashed into a windshield at highway speed. Read more. One was broken down in lane and other tried to get around him. By doing so he got stuck. State Police said today they've cited now former Patriots player Brandon Spikes on charges he rammed into the back of an SUV on I-495, injuring the three people inside early Sunday. Read more. Who abandoned Patriots linebacker's expensive car on 495 with front-end damage? State Police report they are investigating how Brandon Spikes's Mercedes Maybach came to be abandoned on the 495 median strip around 3:30 a.m. - and whether some fresh front-end damage might be related to a Nissan SUV getting hit from behind not far away on 495 northbound. Read more. Channel 4 reports last night's winds ripped open a storage shed at the Amesbury Sports Park, sending the snow tubes inside scudding across the highway. The Globe reports the road was shut around 9 a.m. in Bellingham so a helicopter could airlift a woman whose car veered off the northbound side, crashing into a tree. Where's Harry Chapin when you need him? Channel 4: 40,000 Pounds Of Produce Spilled On 495. 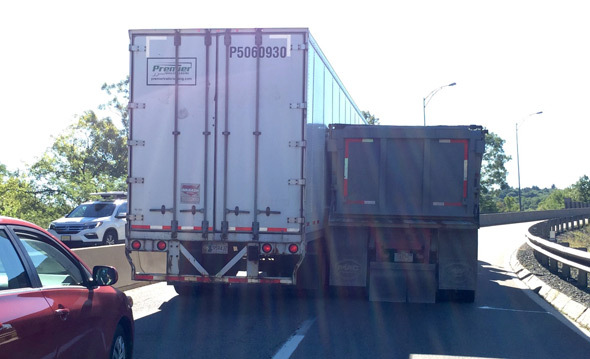 Co-worker Jason Meserve was driving home to New Hampshire up 495 yesterday when traffic slowed to a crawl. After all, it's not every day you see a plane in the breakdown lane. The pilot ran out of gas during rush hour, landed and, naturally, pulled into the breakdown lane (well, actually pushed into it). Meserve reports his ride home took an extra 45 minutes because of the gawkablocka. An amazing simulation of the landing. Not a bloody mess, but red nonetheless. Sandouri Dean Bey can't help but thinking of an old Greek Orthodox story on why Greeks dye Easter eggs red, involving Mary Magdalene carrying a basket of eggs, which she said would turn red if Jesus had risen, and, of course, they did. ... Verily I say unto you, if Christ is risen, this road shall turn red. ... I ran out of the car and supplied my Spongebob blanket to one of the drivers and stayed with her because she was freaking out. So I gave her a hug and held my umbrella over her and just stayed with her until the ambulance showed up (her neck hurt and her eyes were burning from the airbag). The kid whose SUV flipped and slid was okay (God knows how) but was bleeding. ..